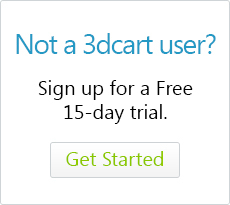 3dcart allows you to specify one or more email addresses to be used for alerting you when an order is placed. Next, click on the "Checkout" tab located along the top of the page. Scroll to the bottom, look for "Send order alert to email address"
In this box, you can enter one or more emails. Below the email field, you will have a series of checkboxes for the order statuses that will trigger the above email notification. How do I get notified of an order? Can the store send me an order alert? How do I know when an order arrives?